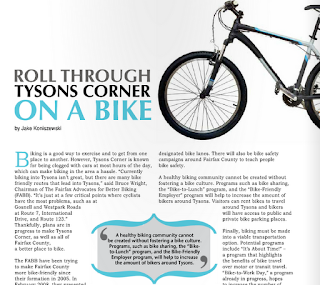 Roll Through Tysons Corner on a Bike by Jake Koniszewski is the latest article on biking in Tysons to appear in Viva Tysons, the bimonthly magazine. FABB is featured prominently, discussing plans for making Tysons more bike-friendly through implementation of the Tysons Bicycle Master Plan. The Tysons plan is part of the recently completed countywide bicycle master plan. The major challenge will be transforming Routes 7 & 123 from multi-lane arterials. It's critical that bike facilities be located along these routes, where most future development will occur. The first of a series of meetings to discuss funding of transportation projects, the Countywide Dialogue on Transportation, will be held on Monday evening at the Springfield Government Center on Rolling Road. All meetings start at 7pm. If cyclists want more funding for bicycle projects, we need to attend these meetings to talk about the importance of providing safe, connected bike routes, especially in the Springfield District where Supervisor Herrity has consistently stated that the bicycle coordinator position should be eliminated. Monday, Sep. 24 at 7 p.m.
Wednesday, Sep. 26 at 7 p.m.
Wednesday, Oct. 3 at 7 p.m.
Tuesday, Oct. 9 at 7 p.m.
Wednesday, Oct. 10 at 7 p.m. The Fairfax Bike Summit is over a month away, on Saturday, October 27, and registration is filling fast. So far nearly 150 people have registered out of 200 available slots. If we exceed the 200 limit we'll see if it's feasible to increase that number. It should be a great event, a first for Fairfax. We've got some good speakers lined up and several local bikes shops will be there displaying bikes and gear. We'll be posting the agenda soon. HB 784 Exercise due care; Drivers to exercise due care. Requires drivers to exercise due care to avoid colliding with a pedestrian or the operator of a human-powered vehicle. HB 785 Following too closely; Includes bicycles, electric personal assistive mobility devices, electric power-assisted bicycles, and mopeds among vehicles that the driver of a motor vehicle shall not follow more closely than is reasonable. It's hard to argue against these bills, especially the bill that requires drivers to be careful around pedestrians and bicyclists. Unfortunately Northern Virginia Delegate Barbara Comstock (34th District) thought otherwise and cast deciding votes in defeating those bills last year. Both delegates represent Fairfax County residents. Thanks to Delegate Lopez for his support. During the legislative session we'll be sending out information about how you can support these bills. We'll also be asking cyclists to contact Delegate Comstock to ask her to support Fairfax bicyclists. We're trying to schedule a meeting with her to discuss her objections to the bills last year. I've been out of town lately so am just getting around to posting about this article by Ashley Halsey III in the Washington Post about sharing the road, What drivers should know about sharing the road with bicyclists (and vice versa). The article is actually pretty good. Instead of just focusing on the need for scofflaw cyclists to behave better, which often happens in this type of article, there's balanced advice for both motorists and bicyclists, including "10 things every driver should know about sharing the road with cyclists" along with "10 things every cyclist should know about sharing the road with drivers." FABB was up early this morning to attend Keep Tysons Moving, an event that provides information about alternative transportation to Tysons employers and employees. We've attended the event for several years and have spoken to many people who want to ride but are afraid because of poor cycling conditions. Several people do ride in Tysons, either by choice or necessity. 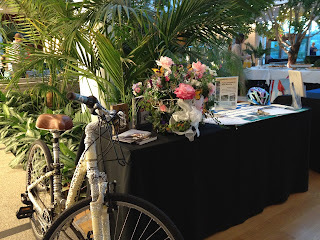 Ann Cavazos of FABB brought flowers and her jewel-encrusted bike and helmet for display at the table; it's a nice touch and likely attracted more people to our booth to learn about FABB, the upcoming Fairfax Bike Summit, and plans for remaking Tysons into a more bike-friendly place. Fairfax County transportation needs over the next ten years exceed available funding from local, regional, state, federal and private sources. This gap is estimated to be around $300 million per year. The Fairfax County Board of Supervisors recognizes that improving transportation is a high priority since the county's economic health depends on an efficient transportation system. The Board of Supervisors is seeking community feedback on ways to generate revenue to address these unfunded transportation (roadway, transit, bike and pedestrian) needs. This effort will consist of a series of community meetings in September and October 2012 at which potential revenue sources will be discussed. County staff will host an online chat in the county's Ask Fairfax! forum, where the public can engage in a discussion about funding for transportation. Time and date of the Ask Fairfax! chat will be announced on the county's web site at www.fairfaxcounty.gov. For more information about the Countywide Dialogue on Transportation Funding, the Ask Fairfax! chat, or to take the online survey, visitwww.fairfaxcounty.gov/fcdot/cdot/. Residents can also visit the web site to sign up for email updates or find out if new meetings have been announced. For more information about this news item, please contact Ellen Kamilakis at 703-877-5606, TTY 711. I had barely gotten the words “Welcome to the National Women’s Bicycling Summit” out of my mouth when a woman in the crowd yelled “It’s about time!” — and a massive cheer erupted from the packed room. I could say the energy and enthusiasm were off the charts for the sold-out (well, more than sold-out) event on Thursday, but a) I’m still speechless and b) even that would be an understatement. With more than 275 women from across the country in attendance, we saw — and, more importantly, felt — our diverse collective power to lead and advance the bicycle movement. Bud Vye of Virginia Bicycling Federation, has been a tremendous advocate for bicycle-related legislation during the short Virginia legislative session each year. We've worked with Bud for many years and he's a great guy; VA cyclists are lucky that he's dedicated countless hours on our behalf. Here's a short interview with Bud from the Richmond Times-Dispatch. Alan Young of FABB is a writer for the Patch. See his most recent article on the Fairfax Bike Summit. The word is spreading fast about the Summit. WABA sent out a notice to Northern Virginia cyclists, and Potomac Pedalers is including a blurb about the summit on the cover of the October edition of their newsletter, Pedal Patter, available in most local bike shops. Please join us for the inaugural Fairfax Bike Summit on Saturday, October 27 at George Mason University (GMU) from 9AM - 2PM. Register here for FREE (ffxbikesummit.eventbrite.com) - Attendance is limited to 200 people – so act fast! You'll also get to hear from nationally-known speakers including Andy Clarke of the League of American Bicyclists, Chris Eatough of BikeArlington, and Stewart Schwartz of the Coalition for Smarter Growth. See the latest in transportation bikes and gear on display from local bike shops. Join GMU staff for a bike tour of campus bike facilities after the summit. A limited number of bicycles will be provided by The Bike Lane. The summit will be held at The HUB at GMU in the Front-Middle Ballroom, 10423 Rivanna River Way, Fairfax, VA 22030. Display space is available for bicycle businesses and organizations. For further information, please visit fabb-bikes.org or contact us at bikesummit@fabb-bikes.org. Sponsored by Fairfax Advocates for Better Bicycling, George Mason University, and Fairfax County. We've heard that Fairfax County DOT have hired a new bicycle (and pedestrian) staff person to work in the county bike program. Her name is Vanessa Aguayo. According to the county bike coordinator, "She has an engineering background, comes to us from the private sector, and has lots of experience in designing bike and pedestrian projects as well as traffic calming." A similar position was held by Jeff Hermann, who has moved within the department. This is a critical time for the county; the bicycle master plan was recently completed and will need extensive staff work when it is presented to the Planning Commission and Board of Supervisors later this year or the first of next year. We look forward to working with Ms. Aguayo in the near future. She is planning to attend the FABB meeting on Wednesday which will be a good opportunity for us to get to know her. Participants are encouraged to use the event to explore alternative transportation modes or more efficient uses of their cars like sharing a ride to sporting events, concerts or other special events. To find others who may be interested in sharing the ride to a special event, drivers can visit Commuter Connections to set up a free account and then request a special event ridematch. Even residents who already use alternative modes of transportation, such as bicycles, transit, walking, and carpooling, can make a pledge to go Car Free or Car-Lite September 22. Plus, those who pledge will become eligible to win great prizes such as an iPad, a bicycle, SmarTrip Cards and more! Pledging is free and easy at www.carfreemetrodc.org. Thanks to Allen Muchnick of VBF for this reminder. He posted a notice on the Virginia bike advocates list, vabike.posterous.com. Registration required. I've heard of bamboo bikes but this is the first paper bike I've ever seen. 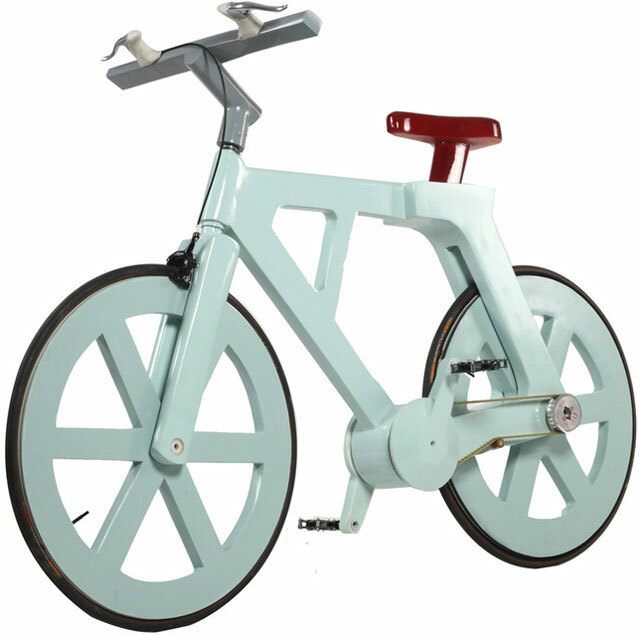 According to Kottke.org, "Izhar Gafni has designed a bike that weighs 20 pounds, costs between $9-12 to build, can hold up to a 485 pound person, and it made out of cardboard." The $9-12 figure seems spectacularly low when factoring in the various components. It will be interesting to see if a manufacturer is found. Engineers told Gafni that his idea was impossible. Yet he realized that paper could be strong if treated properly. As in crafting origami and tearing telephone books, he explains, "[if] you fold it once, and it's not just twice the strength, it's three times the strength." The development to what you see today took three years. Two were spent just figuring out the cardboard complications--leading to several patents--and the last was spent converting a cardboard box on wheels to a relatively normal looking bike. Our Annual Meeting will be held from 1:00 to 4:00 PM Sunday, September 16 in the public meeting room at REI in Richmond. All are welcome. Help elect our 2013 board and officers, and plan our legislative strategy for the upcoming General Assembly. Fairfax Co Parkway Trail still "closed"
We noted on August 22 that due to construction on the Fairfax County Parkway the Parkway trail was closed at the Dulles Toll Road. We sent an email to the NoVa VDOT bicycle coordinator complaining about the closure of the trail, a major throughway for bike commuters in that area. We heard nothing for several days until we were contacted by someone in VDOT who let us know that the bike coordinator was on medical leave. That explained why an earlier message we sent to her on August 3 about the closure of the Parkway trail south of Route 50 went unanswered as well. It's over two weeks since I sent the original message to VDOT about the problem and today I rode past the site. What did I find? "Sidewalk Closed" signs posted on the approaches to the site, with no detour available. Once again we were told not to worry, the construction would end soon and everything would be OK.
For over two weeks this trail has been "closed." Cyclists have been able to get through, but they've crossed a potentially dangerous construction site with no detour and no safety measures for trail users. At one point a front loader nearly ran into me while I waited to get through. As we mentioned in an earlier post, VDOT has clear guidance about providing access during construction. Where pedestrian [and bicycle] routes are closed, alternate pedestrian [and bicycle] routes shall be provided. When existing pedestrian [and bicycle] facilities are disrupted, closed, or relocated in a TTC zone, the temporary facilities shall be detectable and shall include accessibility features consistent with the features present in the existing pedestrian [or bicycle] facility. During the brief time we were riding along this section we saw 5 other cyclists. We've once again written to VDOT about the problem. What is it going to take for the many non-motorized users of our transportation system to get the respect they deserve? 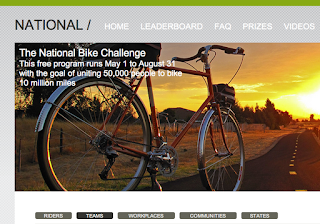 The National Bike Challenge ended on August 31. FABB had a small team of seven riders, five of whom participated during the entire period. According to the final rankings, FABB was 179th nationally for the entire Challenge period, out of 2,695 teams. As a team we logged 11,157 miles, most of which were for local trips as opposed to recreational rides. The top three riders were Ken Schantz (3,319 miles), me (2,748 miles), and Hunter McCleary (2,443 miles). See how other local teams ranked at Bike SW DC. Most of Ken's miles were on his commute to work. In the morning he rides from his home in the Hybla Valley area off Route 1 to the Huntington Metro station. He gets there early and can take his bike on the train to his job in suburban Maryland. He often rides home after work. Hunter's commute is from Vienna to Bethesda and he usually rides both ways. The trip is about 16 miles and takes about the same time as taking Metro. He rides the W&OD Trail to Falls Church. From there he takes West St to the bike lanes on Williamsburg Blvd to Glebe Rd, working his way through neighborhood streets to the Cabin John Chain Bridge. Once in DC he takes the Capital Crescent Trail all the way to Bethesda. My trips this summer were mostly to meetings related to the county bike plan. There were 8 area meetings, 2 countywide community meetings, 5 focus group meetings, bicycle advisory committee meetings, and others. I also traveled to events where FABB had a table, FABB monthly meetings, meetings of the Tysons Bike Group, Partnership for a Healthier Fairfax meetings, WABA board meetings, not to mention the trips to the local Y. It was a busy summer and I rarely drove my car. My wife and I usually log many more miles on our bikes than our cars. I usually don't count miles but it was fun and interesting to track the miles I rode this summer. It's really not that important how many miles we ride as long as we ride. Short trips to the store or work count as much or more than a long recreational ride; there are more of them and they are an example to others that it is possible to take most of our local trips by bike. If you're in the market for a bike, Phoenix Bikes, the Arlington-based community bike shop, is holding a used bike sale on Saturday, Sept. 8 at Big Bear Cafe, 1700 First St NW, DC. A good used bike can be a great deal. A not-so-expensive bike is great for rides to Metro and other places where there's a bike theft problem. If you don't already have a bike, a used bike is a good way to get started riding. FABB is leading a bike rodeo on Sunday September 23 2-4 PM in the City of Fairfax. Volunteers are needed to help with registration and with conducting the rodeo. The event will be in Old Town Fairfax across the street from Oasis BikeWorks and is part of “Discover Fairfax,” which is being organized by the Downtown Business Association. If you are interested in volunteering for the rodeo, contact Douglas Stewart at douglasbstewart@gmail.com or 703-407-2790. The city, George Mason University and Fairfax County created the Mason-to-Metro Initiative, with recommendations to improve sign system and map, on-road bicycle facilities and trails. This fall, the city plans to install shared-use lane markings on sections of Old Lee Highway. These markings, “sharrows,” are two chevrons pointing forward with a bicycle symbol below. Sharrows are used to indicate to cyclists where they should ride in the road. Sharrows also alert motorists to expect bicyclists to share the road. The city also plans to install signs on Old Lee Highway reinforcing the message to share the road. Sharrows currently mark the bike lanes on George Mason Boulevard and University Drive between the university and Old Town Fairfax. Bicyclists have the same rights and responsibilities as motorists on the road. Minor correction: The sharrows on George Mason Blvd and University Dr are not bike lanes. The sharrows are used because there is not enough space for bike lanes. They indicate where cyclists should position themselves in the lane and they signal to motorists to expect cyclists riding in the lane. We're excited to announce the inaugural Fairfax Bike Summit on October 27 at George Mason University (GMU). The purpose of the summit is to bring together current and future bicyclists, bicycle organizations, bike shops, and transportation professionals to discuss how to make Fairfax a better place to live by making bicycling a major component of the transportation system. Hear from nationally known speakers including Andy Clarke, President of the League of American Bicyclists, who lives in Fairfax County; Chris Eatough of BikeArlington; and Stewart Schwartz of the Coalition for Smarter Growth. You can also check out the latest transportation bikes and gear from local bike shops. Register online for free. Attendance is limited to 200 people. Display space is free and available for bicycle businesses and organizations. The event will be held at The HUB at GMU in the Front-Middle Ballroom, 4400 University Dr., Fairfax, VA 22030. Further information is available at fabb-bikes.org and bikesummit@fabb-bikes.org. The summit is sponsored by Fairfax Advocates for Better Bicycling, George Mason University, and Fairfax County. After more than a year of effort that included public meetings with area cyclists, focus group meetings, workshops, and meetings of the master plan Bicycle Advisory Committee, Fairfax County received the final draft of the Countywide Bicycle Master Plan from Toole Design Group on July 31. Charlie Strunk, the county bicycle coordinator, is incorporating final comments, including recommendations approved by the Town of Herndon, and finalizing the map of recommended bike facilities. The next step in the process of getting the Plan approved is to present it to the Planning Commission Transportation Committee, followed by a public hearing before the full Planning Commission, probably after the first of the year. The Board of Supervisors will then hold hearings and take a final vote on the Plan. Twenty cyclists joined FABB on August 25 for our latest social ride, a slow-paced guided tour of McLean. FABB member Dennis Frew led the group through neighborhood streets past several local points of interest including the homes of several Supreme Court justices, Vice President Cheney's house, and Hickory Hill, the former home of President Kennedy and Senator Robert Kennedy. Our next ride will be a tour of Reston that will include stops at the Nature Center, Wiehle Ave Metro Station, Bowman House, Brown's Chapel, historic Lake Anne, and the Reston Town Center. Date TBD. For the past year FABB has worked with Visit Fairfax, the official Fairfax County tourist information group, to include information about bicycling in their outreach materials. The Visit Fairfax website, www.fxva.com, is used by visitors to the county to find out about upcoming events and attractions. Visitors can also obtain information about lodging, restaurants, and shops. Now biking information is included on the site on the Biking and Hiking page. The Biking and Hiking page has a link to the county bicycle route map, a list of places to rent bikes, and a link to the FABB website that contains a cornucopia of bicycle information on the Cyclist Resources page. Thanks Visit Fairfax! See our blog entry about the new page. FABB Fact: Fairfax County is home to 53 Historical Markers, most of which are difficult to read from the seat of a car. Check out some of them by bike. Contact us to help create a Fairfax Historical Marker bicycle tour. Tuesday, September 11, 10:30am - Board of Supervisors Public Hearing on FY2013 Revised Budget - Speak out for funding of the Bicycle Program. We in Northern Virginia are lucky because the W&OD Trail serves as a sort of bicycle superhighway, a very direct route into the District. We could use more. We need bicycle superhighways from the more populated areas such as Springfield, Annandale, Burke, West Springfield, and along the Route 1 corridor into the District. We need a Bicycle Beltway leading to the many destinations along the Beltway corridor. Having bilateral support is important; bicycling should not be a partisan issue but it has become one in this country. Everyone needs to realize the potential for using bicycles in Fairfax, if we have first class bike facilities. Just think how many more people would travel by bike if we had more facilities like the W&OD Trail, which is often overcrowded with cyclists most weekends. 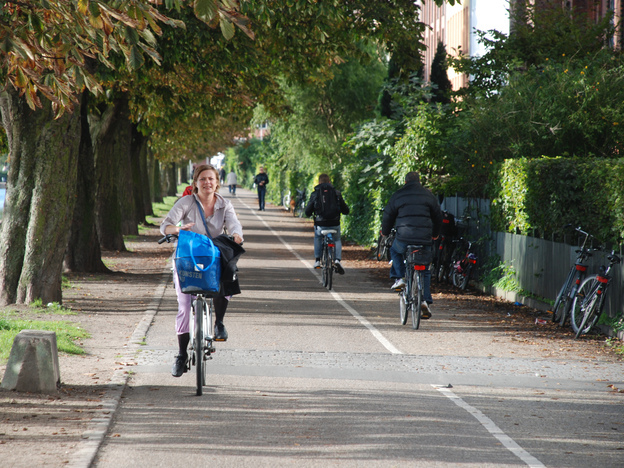 Having a bicycle-friendly community doesn't just happen; it takes political will, financial support, and encouragement, all of which have made Copenhagen and other European cities places where bikes are an integrated part of their transportation networks. To see how we can transform Fairfax into a more bicycle-friendly place, be sure to attend the Fairfax Bike Summit on Saturday, October 27 at GMU. Register online for free.